Democrat Cathleen Galgiani currently represents Senate District 5 and will not be termed out until 2020. 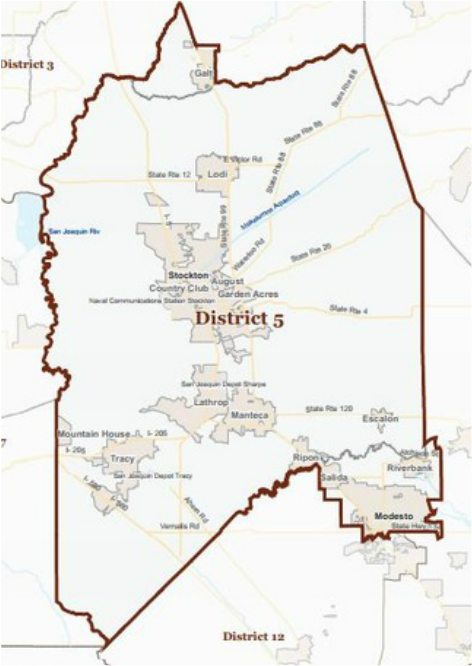 Galgiani is expected to win re-election in 2016; however, a well funded and well known Republican could compete for this seat due to a close split in voter registration. Elected to the Senate in 2012, Senator Cathleen Galgiani represents the 5th District, which includes Stockton, Tracy, and Modesto. As a 5th generation Stocktonian, Cathleen has lived and worked in the San Joaquin Valley all of her life. While working in public service, she has been involved in a wide range of issues including protecting agriculture, cleaning up the air in the Central Valley, cutting government waste and fraud and fighting for Cal-Grant expansions so that more kids can go to college. Additionally, she helped to secure funding and support for UC Merced as a consultant to the Legislative Committee on the Development of UC Merced. During her first term in the Legislature, Galgiani has worked to protect agriculture, improve education, protect health-care funding, increase public safety, enhance public transportation and save taxpayer dollars. Additionally, Cathleen continues to work diligently on Homeownership Preservation through legislation and local workshops. The home mortgage crisis has disproportionately affected the 5th Senate District and Cathleen will continue to work on solutions and relief for troubled homeowners. In the Assembly, Galgiani represented the San Joaquin Valley in the Legislative Committees on Agriculture, Higher Education, Governmental Organization and Transportation Committees. She was also a member of the Child Abuse Prevention Council Auxiliary of San Joaquin County, an advisory member of Crime Victims United of California and a member of the American Legion Auxiliary, High Speed Rail Committee of Merced and the Board of Directors of San Joaquin A+.